Volvo expects the XC60 to help drive another year of increased sales. DETROIT (Bloomberg) – Volvo will expand production capacity for the XC60 crossover as it predicts U.S. demand will propel growth, the carmaker's CEO Stefan Jacoby said. Volvo Cars, a unit of Zhejiang Geely Holding Group Co., boosted sales 11 percent to 373,525 cars last year and anticipates the S60 sedan and XC60 will drive another year of increased sales, with deliveries likely to rise at least in line with a 6 percent to 7 percent growth projection for global auto demand, Jacoby said. “We expect to grow significantly” in the U.S. and globally, said Jacoby, who plans to more than double sales to 800,000 vehicles in 10 years. Volvo Cars, the Swedish brand sold by Ford Motor Co. to Zhejiang Geely last year, is increasing annual production capacity at its factory in Ghent, Belgium, for the XC60 to 110,000 units from 95,000, Jacoby said at the Detroit auto show on Tuesday. 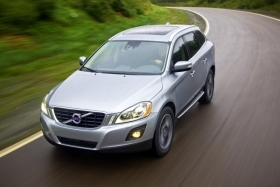 Volvo Cars also plans to take market share in the U.S. after suffering a 12 percent decline in 2010 sales. To support U.S. sales, Jacoby renewed Volvo's leasing program and will spend more on marketing. Volvo's advertising budget for the first quarter, for example, is more than its entire 2010 spending, the Volvo chief said. Volvo said Dec. 29 that it will boost its workforce at its plant in Gothenburg, where the carmaker is based, by 200 to about 3,400 as it plans to expand production there to 52 cars per hour from 48. Zheijiang Geely may begin building a Volvo plant in China this year, President Yang Jian said in an interview Tuesday. The automaker is leaning toward starting production in Chengdu, a Volvo union representative and board member said last month.